BEIJING, -- Before the parade got underway, President Xi Jinping delivered a keynote speech. He reflected on history and said China will continue to take the path of peaceful development. He then inspected over ten thousand Chinese troops and the country’s most advanced weaponry. "In the interest of peace, China will remain committed to peaceful development. We Chinese love peace. NO matter how much strong it may become, China will never seek hegemony or expansion. It will never inflict its past suffering on any other nation. The Chinese people are resolved to pursue friendly relations with all other countries," President Xi said. And China is fulfilling its promise. "Here I announce that China will cut the number of its troops by 300,000," President Xi said. President Xi, we are ready for your inspection! Since the founding of the People’s Republic of China 66 years ago, China has held 14 military parades on the National Day. This is the first one on Victory Day, to commemorate the sufferings and contributions of the Chinese people during the war. China was the main eastern battlefield in World War II. I declare the start of the march-past! 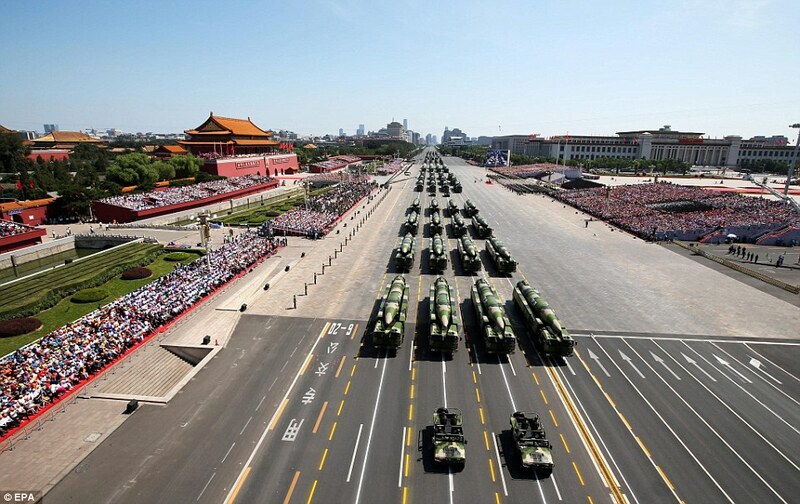 50 formations marched through Tian'anmen Square, including 11 foot formations, two formations of veterans in vehicles, 27 armament formations and 10 air echelons. For the first time, veterans are marching. Seventy years ago, they risked their lives to protect their nation and people. Today, they take pride of place. Another first is foreign troops. Most of them were China’s allies during the war. China wants to tell the world that it will not forget their support and sacrifice. More than 500 pieces of China's latest military equipment, most in their public debut. The land forces’ mainstay 99-A tank, and the 05 amphibious armoured vehicle, suitable for both land and sea combat. China’s Second Artillery Force showcase their most advanced Dongfeng series, including the conventional DF-15B short-range missile; the land-based DF-21D anti-ship ballistic missile; the DF-26 missile for both nuclear and conventional use; and the DF-31A, solid-fuel intercontinental ballistic missile. China is showing the new domestically-produced weaponry to demonstrate the military's development and innovation. China is in transformation. Building a strong national defense and powerful armed forces is key to modernization and a security guarantee for its peaceful development. 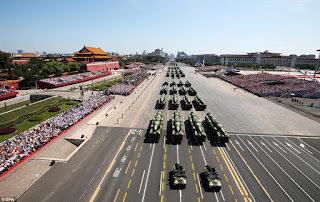 Dozens of armoured vehicles and ballistic missiles roll through Tiananmen Square in Beijing for China's biggest-ever display of military hardware in a parade to commemorate victory over Japan in World War Two.